The neighborhood's active lifestyle centers on the community s impressive 16,000 square-foot clubhouse. Here residents can enjoy the heated indoor swimming pool, large state-of-the-art fitness center, and an aerobics studio. Del Webb is known for building inviting amenity centers and the clubhouse at River Pointe is no exception. There is plenty of available space for get-togethers, including a billiards and card room, arts and crafts studio, library, and meeting rooms. Additionally, residents can visit The Retreat Cafe at any time of the day to get a snack or beverage. Built by Del Webb, the homes in River Pointe have been designed with active adults in mind. Started in 2007, homebuyers can select from both new construction and resale homes. Each of River Pointe's single-family homes offer an open floor plan and an attached two-car garage. The homes are available in ten different models and range in size from 1,269 to 2,020 square feet and include two or three bedrooms and two to four bathrooms. Select floor plans also include such options as a front porch, loft, morning room, sunroom, or basement. Three floor plans are available with the optional loft: the Reston, Newhall and Copper Ridge models. This extra loft space adds approximately 800 square feet to the home, with an extra bedroom and bathroom. The Reston and Newhall floor plans can be further expanded with an optional basement. Residents here can choose from a variety of amenities and activities, letting them make their social calendars just as full as they wish. Along with the community amenities offered through the spacious clubhouse, residents can participate in various social clubs. These groups cover a range of interests, such as sewing, card games, bowling, karate, and movies. Special interest groups include the bowling league, book club, and singles club. Stay in shape with zumba, yoga, or aquacise. River Pointe is located in a picturesque, wooded section of Manchester Township. There is convenient access to popular points along the Jersey Shore including Seaside Heights, Point Pleasant, and Lavallette. River Pointe enjoys close proximity to major cities as well. Both Atlantic City and Philadelphia are within an hour's drive, while Manhattan is only 90 minutes away. While River Pointe has plenty to do within its own gates, residents will enjoy all that the town of Manchester has to offer. Local shops include everything from specialty boutiques to retail chains like JCPenney, Wal-Mart, Target, Macy's and Boscov's department stores. With its convenient location, it is easy to explore the area surrounding River Pointe. The community is close to several major roadways, including Garden State Parkway, Route 9, and Highways 37 and 70. There are many nearby medical facilities as well, including four hospitals and private practices for both general practitioners and medical specialists. With an abundance of amenities, conveniences, and well-built homes it s easy to see why River Pointe is a favorite active adult community in Ocean County, New Jersey. The Retreat Clubhouse - 16,000 Sq. Ft. 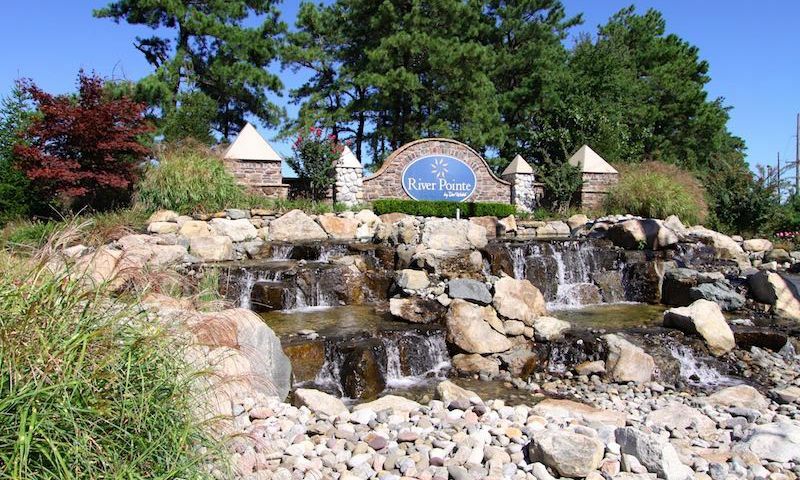 There are plenty of activities available in River Pointe. Here is a sample of some of the clubs, activities and classes offered here. There will be 504 single-family homes within the gates of River Point upon completion. Homes range from 1,269 to 2,020 square feet. Homes feature two or three bedrooms, two to four bathrooms, and an attached two-car garage. My wife and I looked for years to find a perfect community. North Carolina, South Carolina, Pennsylvania and New Jersey. We kept on coming back to River Pointe. We now have lived here for over two years and know that we made the right decision. We have so many new friends with many more to come. Being close to the beaches is a great bonus. We also like the fact that it is a younger community. Still being built. We've lived here for a couple years and our home does have the extra loft space as the prior review mentioned. It is fantastic! We love our home and we love the community. The clubhouse offers so much to do and lots of activities. We literally go to the clubhouse almost every single day whether we just go to the gym, play some tennis, swim or go for something else like my sewing club, games or just meeting up with friends for coffee. It's a wonderful community and everyone who comes to visit us is always very impressed. Just went to see the models at River Pointe today sept 16 2012. They are beautifu. I Especially Liked The Copper Ridge with the optional loft. Had we not purchased our home in Silver Ridge in Toms River 2 years ago , we would definitely had purchased a house today. Very very Impressed to say the least! 55places.com is not affiliated with the developer(s) or homeowners association of River Pointe. The information you submit is distributed to a 55places.com Partner Agent, who is a licensed real estate agent. The information regarding River Pointe has not been verified or approved by the developer or homeowners association. Please verify all information prior to purchasing. 55places.com is not responsible for any errors regarding the information displayed on this website.